Well, most of us are fully aware of Vivienne Westwood’s ‘out there’ designs which really came into their own via the punk movement back in the 70’s – lots of tartan, ripped t-shirts, safety pins and total flamboyancy. You don’t have to love ‘fashion’ or the lady herself to enjoy this entertaining feature length documentary celebrating the Brit designer…. You can’t help but be intrigued by her and at the same time really respect her bluntness and her genuine eccentricity! 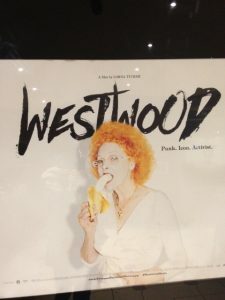 There’s a certain level of chaos which seems to surround her and her concern for the Westwood business which has grown so large to the point of her questioning ‘who is in charge’ of making certain decisions? When talking about her husband Westwood says “I like living with him as much as I like living on my own,”. They seem to share the creativity of the business 50/50 and are both very ‘hands on’; quite literally hands on! Adding pins, bits of material and new ideas straight onto the models body. I thoroughly enjoyed this little glimpse into the world of one of the UK’s most iconic Designers; she really is quite a woman!